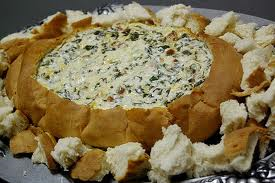 Spinach Dip. Nobody will know the difference. Cook spinach as directed on boxes; cool. large bowl, mix all ingredients except bread. 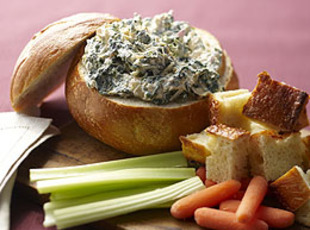 top slice and hollowed-out bread into bite-size pieces. bread pieces around loaf to use for dipping. 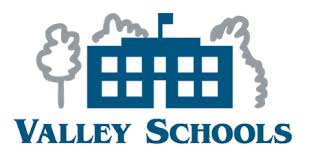 Provided by Rebecca McGonigle of the Valley Schools Employee Benefits Trust (VSEBT) from the February Wellstyles Monthly Newsletter. We will have to try this. looks yummy.